There are significant differences between Locals and Tourists in the perception of the places: the first group generally shows a better opinion of the city, finding it more Active and Dependable. Nationality has an influence on the place’s perception: e.g. Irish and Germans valued Activeness between 10 and 21% more than Italians and Americans. People who perceive a place as Exciting and Hospitable are more likely to recommend it: these two dimensions could work as recommendation factor then. The same happens with positive feelings that are positively related to the recommendation level. Differences between Local and Tourists show that the more the visitors are familiar with a place, the more they appreciate its positive aspects, finding it lively and safe. Also people disclose to appreciate qualities such as Excitement and Hospitableness when considering a place worthy of being recommended. This could be an interesting angle for promoting Dublin tourism growth. 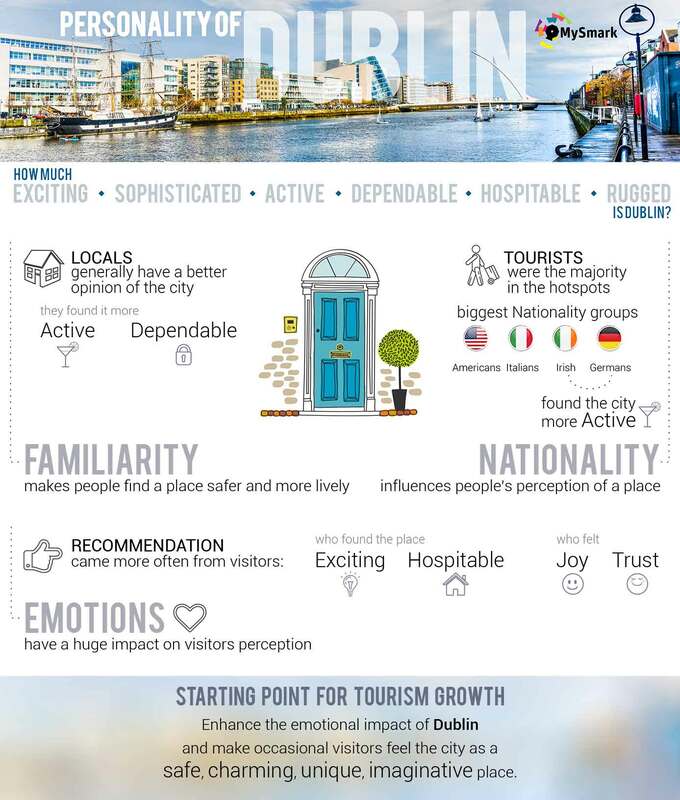 Excitement in particular is about perceiving a place as charming, unique and imaginative: what local authorities could enhance would be the emotional impact of Dublin’s best (and less) known attractions on occasional visitors, while the Irish friendliness will make the rest.